Tired of Having Audition Nerves Kill Your Auditions? Are you sick of working really hard on your audition sides, only to get to the audition room, have your nerves kick in and kill your chances to give an amazing reading and secure a callback? It doesn’t matter if you’re Oscar-winning brilliant when you’re rehearsing at home or with your coach…. If you get into the room that matters most – the audition room – and your nerves take over, they can kill your hard work and creative brilliance, and leave the Casting Director questioning whether you can pull it off on set. Not only will the Casting Director doubt you, so will the Producers, Directors and Network & Studio Execs. They will make a snap judgment about your ability to do the job on set and deal with a quick production schedule or a fast-paced publicity campaign if your nerves are an issue. You didn’t do anything wrong. You’ve likely fallen under the mistaken impression that audition nerves “just happen” and you just have to deal with them. Nope. There's a much better way. 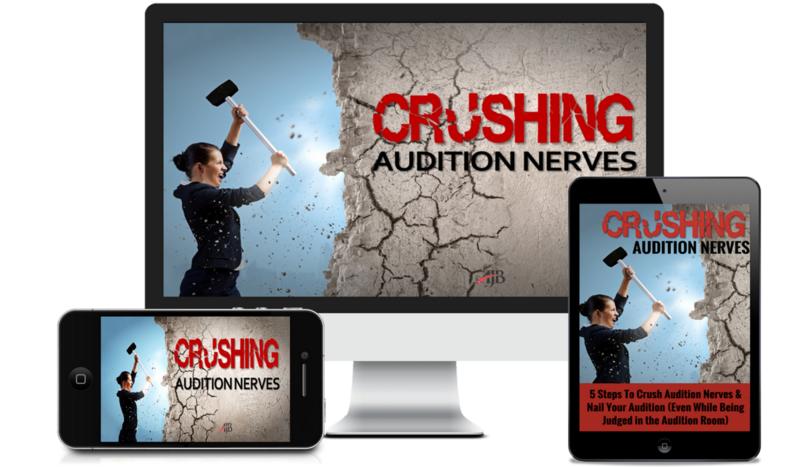 “The 5-Step Nerves Crusher” – The 5-step process and how to master it so you so your “audition nerves” never have power over your audition again. Click the “Add To Cart” button now and learn the 5 step process to crush audition nerves before they start.